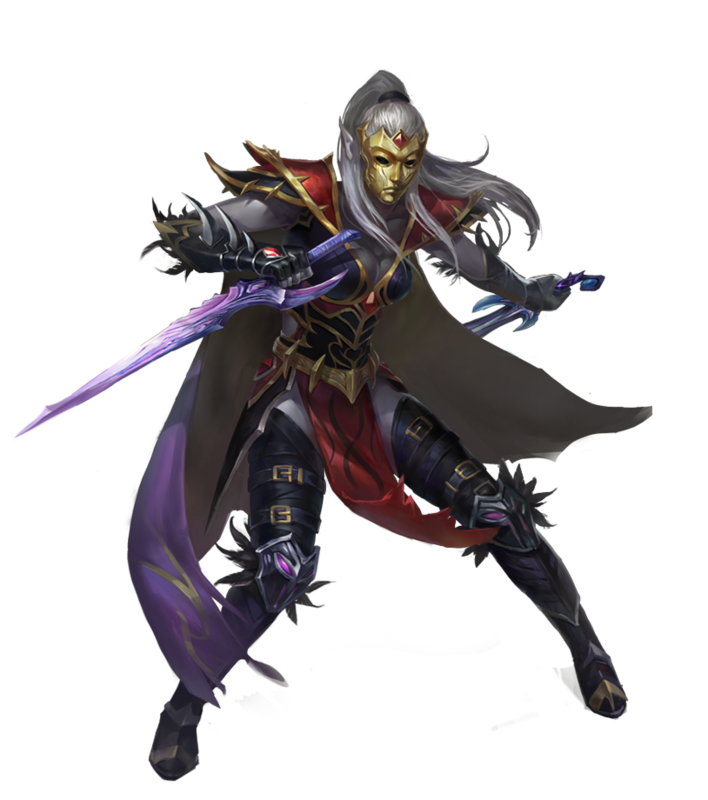 The Dark Elf Assassin is like the shadow of Malassa. Moving between shadows, Assassins have mastered the art of plunging a blade between their target’s shoulders. 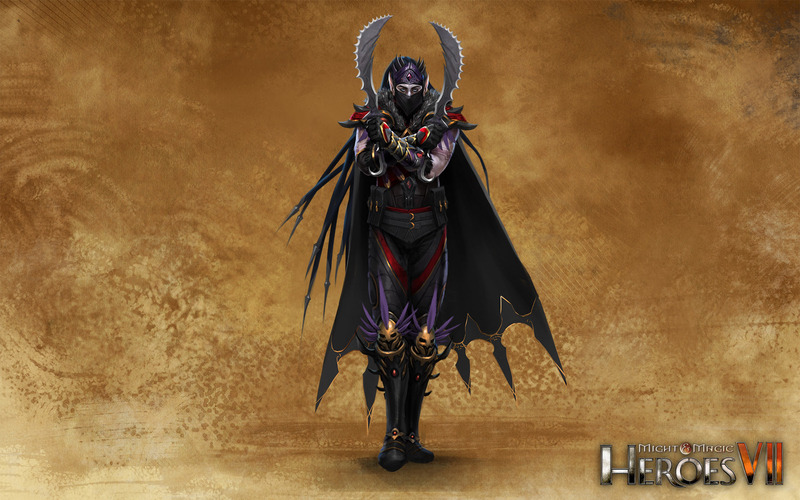 Usually wearing black clothes, the Assassin`s favourite weapons are a pair of sharp and serrated daggers. The Shade is an assassin mastering the dark art of poisons. His daggers are tempered in a mysterious kind of spiritual poison that slowly erodes his victim`s life force. A young Dark Elf needs to know several arts to survive in Ygg-Chall: magic, alchemy, swordplay… and of course, assassination. Using uncanny agility, Assassins deal tremendous damage when hitting from behind, increasing the normal full flanking bonus. The Shade`s blade is poisoned and will deal damage long after the first cut. 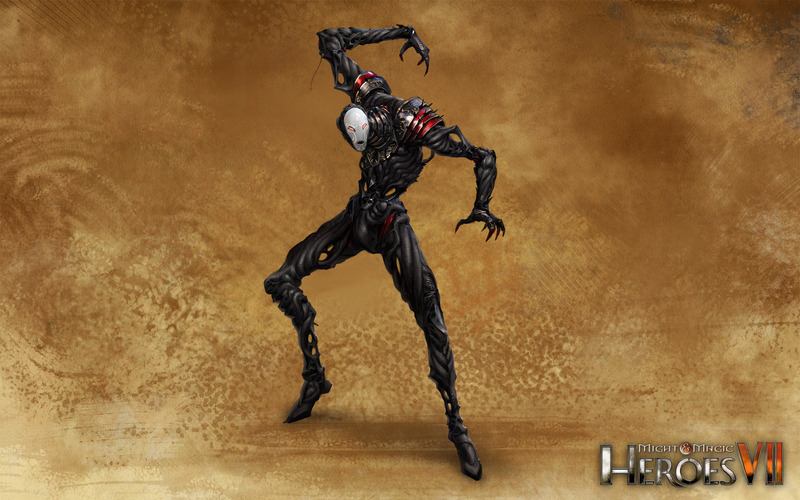 The Stalker is the typical Dark Elf whose words are soft as silk with a slight perfume of poison. Stalkers are fearless and fearsome, not known for long speeches but for expeditious action. In the early decades of the War under the Mountains, Stalkers were known to bring chakrams to battle, but they now prefer using crossbows. The Dark Elves have always respected assassins, but they reserve particular esteem for those killers who are masters of stealth, capable of taking their unsuspecting victims by complete surprise. The finest exponents of this art are the Trackers. Evading the traps, swords and spells of their foes, the Tracker will slip unseen past any guard in order to deliver the fatal blow to her target. Dark Elves fight dirty. Stalkers are a good reminder of that fact. 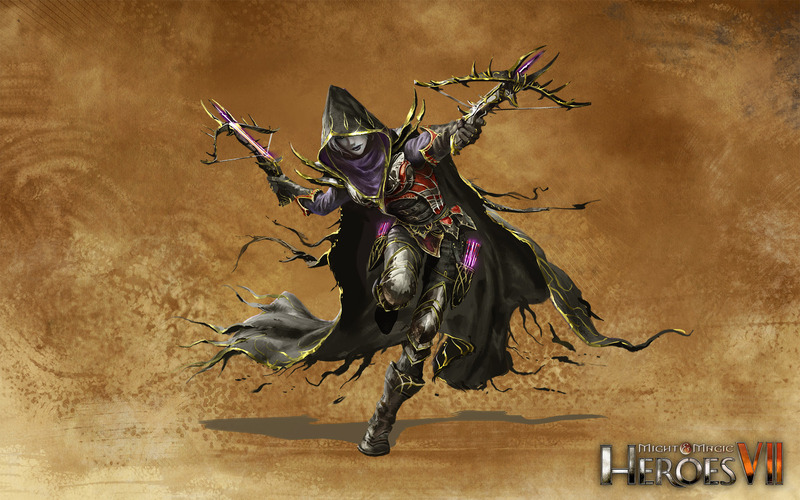 Trackers carry special crossbows, cut from the roots of a Treant, their trigger and mechanism forged from Shadowsteel. They shoot further, send quarrels truer, and inflict more grievous wounds than any regular bow or crossbow. 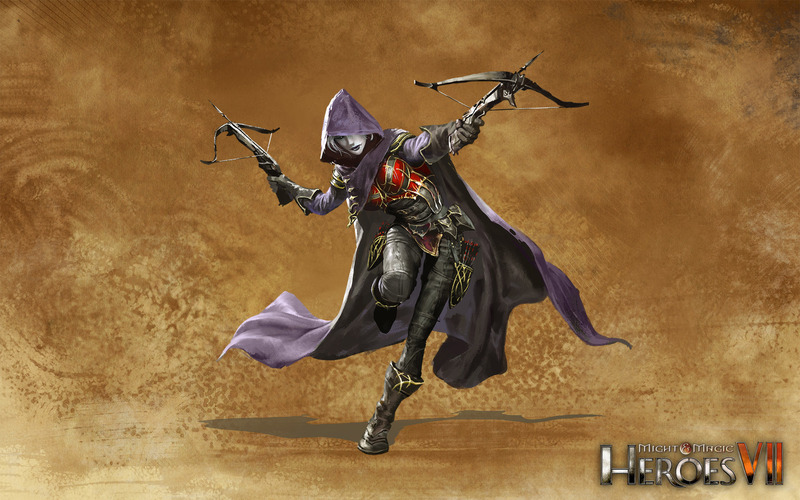 The crossbow bolts of the Trackers are so powerful that they ignore their target`s defense. Troglodytes are minor spirits of the Earth that were bound to the material plane millennia ago, and have been striving in the deepest bowels of Ashan’s underground world ever since. Blind and possessing only basic intelligence, they are relentless diggers and burrowers, carving new caves and tunnels as if following some unknown design. After decades of digging tunnels below the surface of Ashan, some Troglodytes take on the characteristics of the rocks and minerals they spend their time excavating. This metamorphosis make them more resistant to all kinds of physical harm, and earn them the name of Chthonians. The Dark Elves were quick to realize the usefulness of these creatures to expand their subterranean empire, and have been using magic to force Troglodytes to do their bidding. A legend claims Troglodytes keep on solidifying, eventually becoming pillars of living rock, fortifying the tunnels and burrows dug by their brethren. The creature is naturally blind and therefore immune to blindness and magical effects relying on sight. Damage and negative effects of Earth spells have no effect on this creature. The Crimson Wizards of Al-Rubit, in a diplomatic gesture that surprised many and angered their neighbours in the Silver Cities, made a gift of one thousand loyal Minotaurs to the Dark Elves. In a short period of time, the Minotaurs took oaths of loyalty to the Dark Elves and Malassa. Minotaurs were used to act as protectors and bodyguards to their Wizard masters, and they had no issue fulfilling a similar role for the Dark Elves. In a society where assassination is a way of life (and, quite probably, of death), hiring a couple of Minotaur Guards is usually a wise move. Most Dark Elves appreciate the Minotaurs’ strength and reliability and consider them valuable allies. But a few clans, notably the Soulscars, tend to see them as little more than slaves. 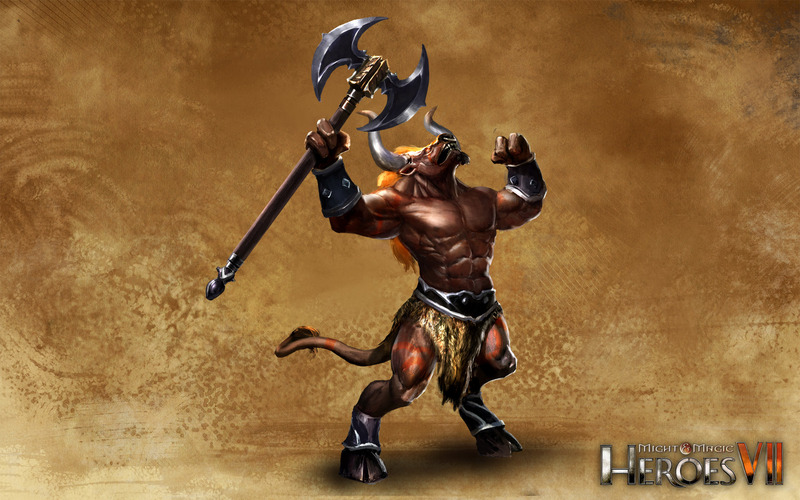 Minotaurs often fight battles in gladiatorial arenas to prove their strength and impress future employers. Although their axes are incredibly large, Minotaurs can wield them without effort. Their striking speed is such that they can retaliate before being hit. The power of the Minotaur Guard`s attack is so huge that the shock it triggers makes it impossible to retaliate it. While they are better sorcerers, the Faceless do not possess the physical might and battle prowess of their archenemies, the Angels. To even the odds, and because ruse and deception are not always a viable option, the Faceless have created the Striders. These “living armours”, made of Shadowsteel, are not dissimilar, in principle, to Wizards’ constructs like Golems or Soullesss. The Soulless are possessed by the essence of a Faceless puppeteer, who controls it from the shadows. While capable of standing their own in a fight, their main role is actually to disrupt and negate the enemy’s magic. Some say Striders are actually grown from the very blood of the Faceless. As if they weren’t creepy enough. Most the time, Souless fight the Angels of Elrath, which is why the Soulless are especially efficient against the powers of the Light. 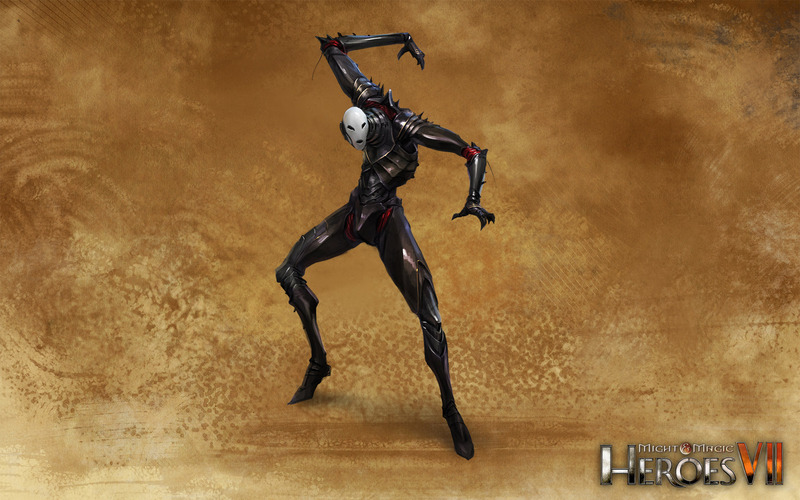 Like all Constructs, Striders are animated by magic, and therefore not alive. 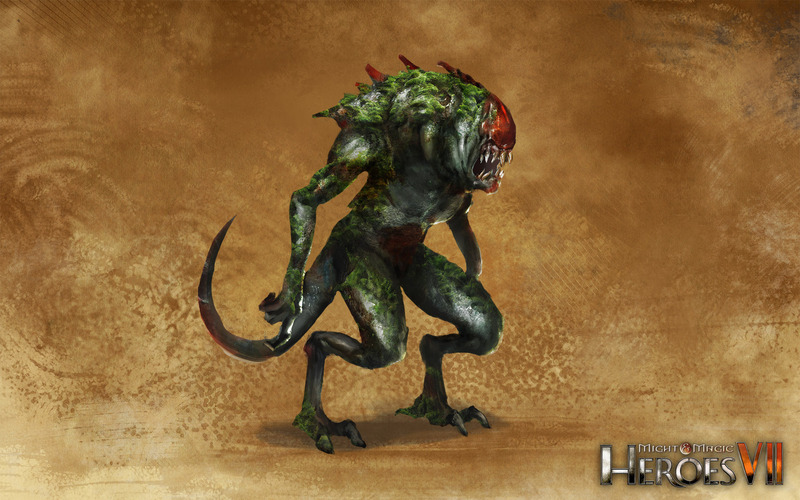 They are immune to poison, blindness, mind effects and morale effects. They cannot be healed or resurrected. Damage and negative effects of Dark spells have no effect on this creature. The powerful Dark Magic at the heart of the Soulless makes nearby allies resistant to Light and nearby enemies vulnerable to Darkness. The Dragon Gods have many faces, not all of them nice. 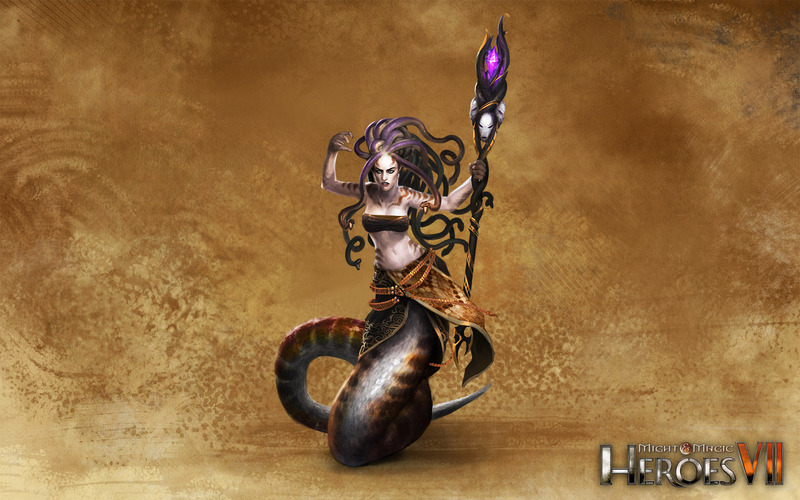 Naga Priestesses who succumb to the madness of the depths are exiled from the Lotus Empire, and become known as Medusae. Most Medusae worship the Wrecker, the destructive aspect of the Dragon Goddess of Water, but the ones found in Ygg-Chall are also pretty good with Dark Magic. 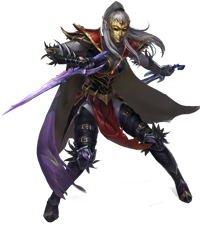 During their quest to find a way to bring back the Faceless Library from Sheogh and make it the centre of their new realm, the Dark Elves encountered a faction of renegade Nagas, led by Daimyo Oshiro the Accursed. 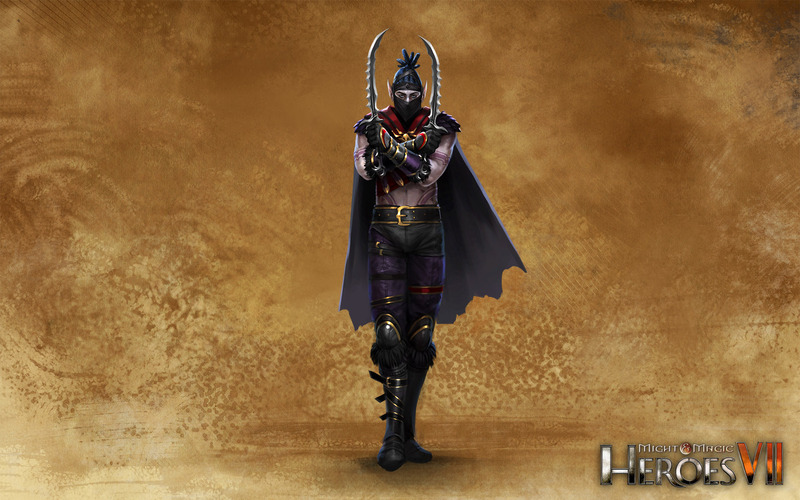 After being conquered, Oshiro’s people became part of the Dark Elf kingdom. Medusa Sorceresses had no issue finding their place in Ygg-Chall’s society. The Wrecker and Malassa are not mutually exclusive. After all, what lies in the heart of the ocean if not Darkness? 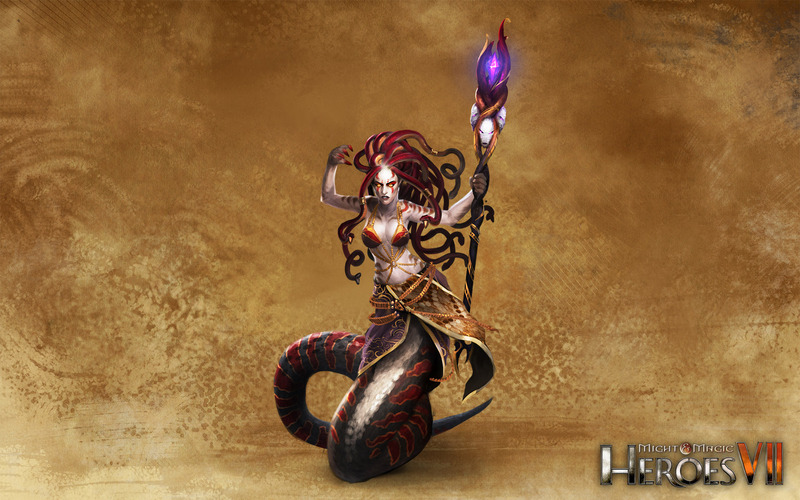 Medusa Sorceresses proved their worth against the Dwarves during the last years of the War under the Mountain. The Medusa`s gaze is a terrifying view, and in battle, might paralyze its unfortunate target. The serpentine body of the Medusa Sorceress allows her to focus on both movement and shooting without any problem, so they can either move and shoot or shoot, then move. Hydras are among the most formidable Magical Beasts to roam the lands of Ashan. 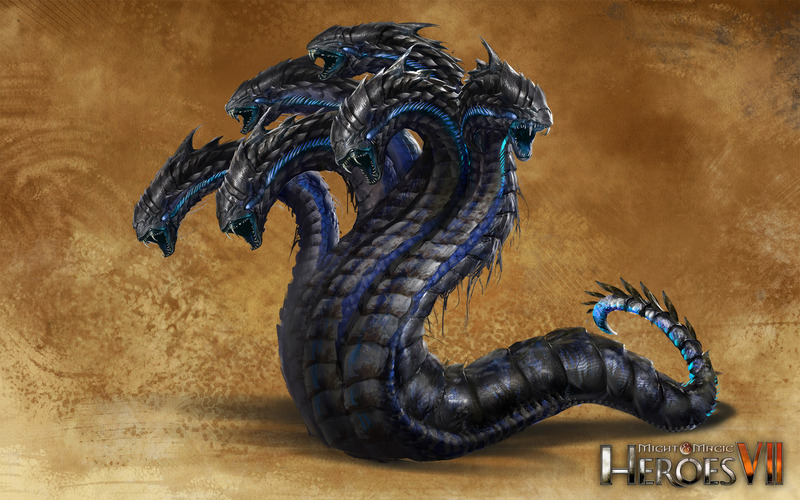 These giant snakes, mutated by the raw magic unleashed during the Mythic Age, possess multiple heads, allowing them to attack several opponents at once. 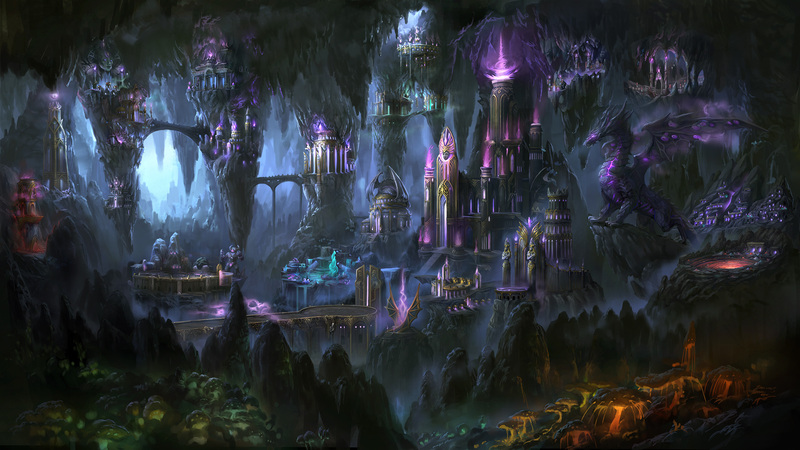 The Dark Elves have learned to tame the Cave Hydras dwelling in the bottomless Abyss. There are as many types of Hydras as there are Dragon Gods. Some of them are purely serpentine, others have reptilian legs, and the exact number of heads varies from one species to the next. Dark Hydras have become attuned to the powers of Darkness, and can regrow severed parts by draining the life force of their victims. 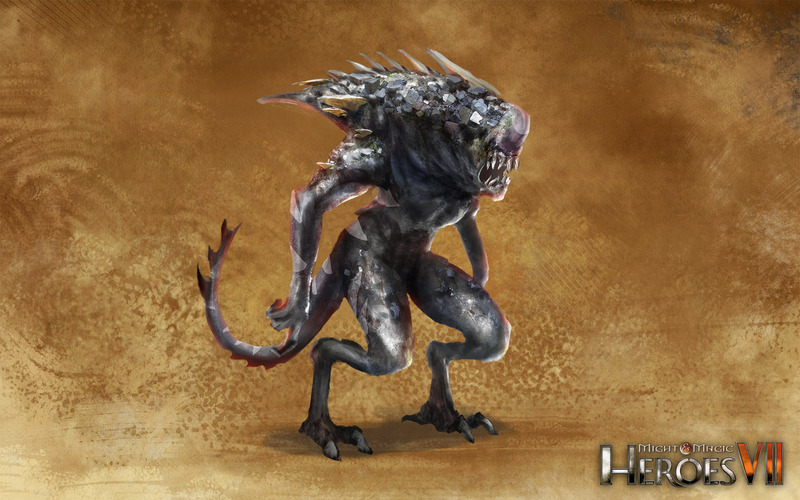 The Hydras’ bite is nasty and, depending on the Dragon whose spilled blood was involved in the Hydra’s creation, it will have varying effects on the unfortunate victim. Dark Hydras are among the most terrifying creatures one can encounter in the Abyss. There’s a malevolence and relentlessness about them than make my skin crawl.. 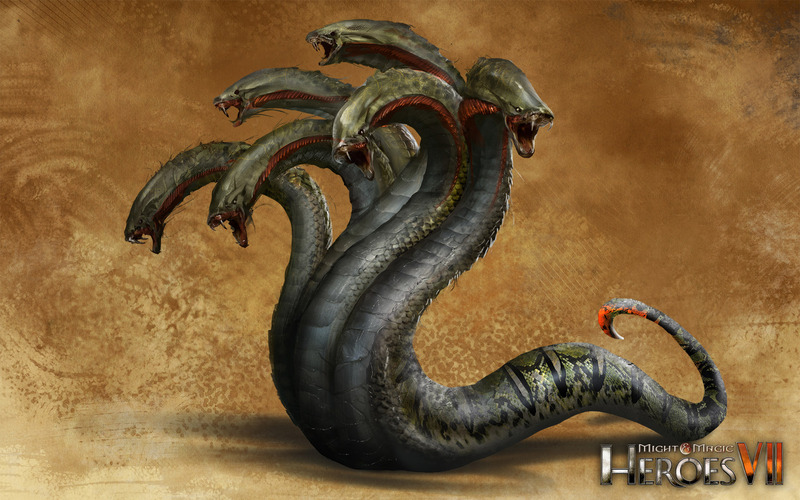 The Hydra can use all its heads to attack adjacent enemies, at once. Dark Hydras can literality drink the blood of their enemies, using it to regenerate themselves with unmatched efficiency. The Shadow Dragon is the avatar of Malassa, the Dragon Goddess of Darkness. They take the form of a dragon of onyx, with purple orbs embedded on their wings – these are the eyes of Malassa, capable of seeing any kind of shadows, literally or metaphorically. The Shadow Lurkers are said to be born from these glowing orbs. The ultimate evolution of a Shadow Dragon is the legendary Black Dragon. On their wings, the eyes of Malassa are replaced by intricate patterns of light constantly dissolving, like galaxies being swallowed by the endless darkness of space. So, who would win in a fight? A Black Dragon, or a Titan? This huge flow of Dark Magic hurts and decays multiple targets, and prolongs its effect after the initial attack. 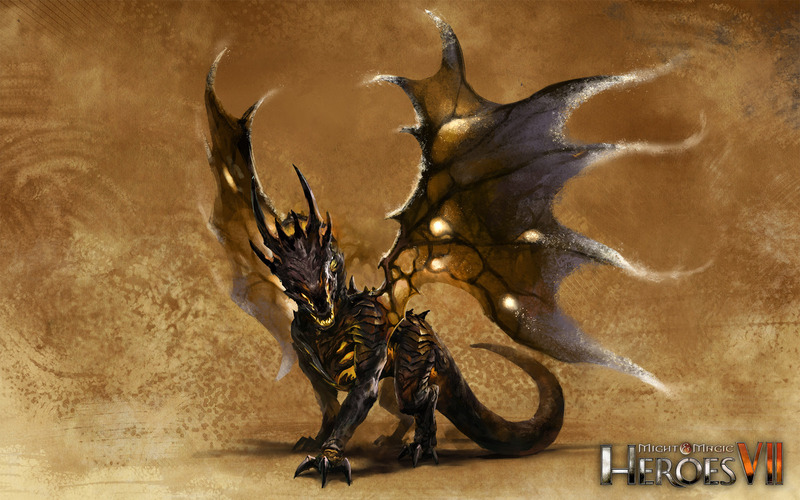 Know to be extremely resilient to magic, the Shadow Dragon is perfectly immune to its own element: Dark Magic. 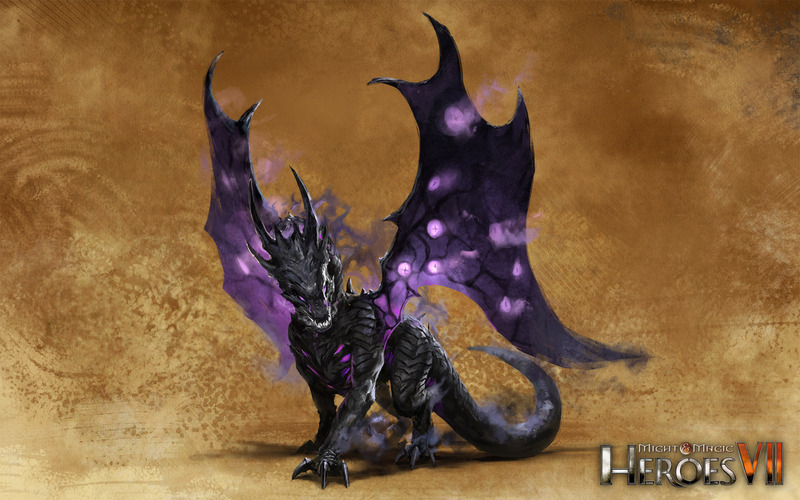 The Black Dragon is one of the rare creatures of Ashan to be completely immune to magic.